(Sept 2): Turmoil returned to Wall Street on Tuesday after a brief rest, with renewed concerns about China's economy pushing major indexes down almost 3% and intensifying fears of a long-term selloff. 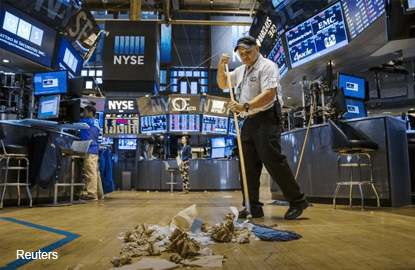 The S&P 500 is now 10% lower than its May record high, with the prospect of slowing global growth and an impending US interest rate hike curtailing a robust bull run that saw the index gain over 200% from the depths of the financial crisis in 2009. Tuesday's was the S&P's worst drop since Aug 24, when it slumped 3.94% after three days of increasingly volatile losses. "The fact we were down in August at a magnitude that is bigger than we have seen in many years rang some alarm bells," said Mohannad Aama, managing director of Beam Capital Management LLC in New York. "The continued uncertainty about China is definitely adding to worries." China's manufacturing sector shrank at its fastest pace in three years in August. Other data showed the pace of growth in the US manufacturing sector slowed last month to its weakest in over two years. The weak data pushed oil prices down more than 7%, ending three days of gains, and also reduced some investors' expectations that the Federal Reserve would raise interest rates this month. The S&P energy index fell 3.7%, with Exxon down 4.19%. The financial index dropped 3.5%, with Citigroup down 4.75%. The CBOE Volatility index, known as Wall Street's "fear gauge", was up 10.45% at 31.40, above its long-term average of 20. The index had spiked to 53.29 last Monday. "We haven't see this kind of volatility in a while. It reminds me of the one we saw during the 2008-2009 crisis," said Art Hogan, chief market strategist at Wunderlich Securities. The Dow Jones industrial average fell 2.84% to end at 16,058.35 while the S&P 500 lost 2.96% to 1,913.85 points. The Nasdaq Composite dropped 2.94% to 4,636.11. For the year, the Dow is now down 9.9% while the S&P is 7.0% lower and the Nasdaq is off 9.9%. Those losses have pushed the S&P 500's valuation down to a relatively more attractive 15.6 times expected earnings, compared to around 17 for much of 2015, according to Thomson Reuters StarMine data. But investors fear that the outlook for earnings may darken. "Earnings estimates are probably higher than they should be and do not take into account the effect that a global slowdown led by China would have on the US," said Aama. Netflix fell 8.03% after Variety reported that Apple was looking to move into the original programming business. Apple fell 4.47%. Declining issues outnumbered advancing ones on the NYSE by 2,666 to 422. On the Nasdaq, 2,291 issues fell and 563 advanced. The S&P 500 index showed no new 52-week highs and 14 new lows, while the Nasdaq recorded 12 new highs and 57 new lows. Volume was lighter than in recent days. About 8.9 billion shares traded on US exchanges, compared to an average of 9.4 billion in the past five sessions, according to BATS Global Markets.